There are a range of different tools you can use to mark fabric while making a project. 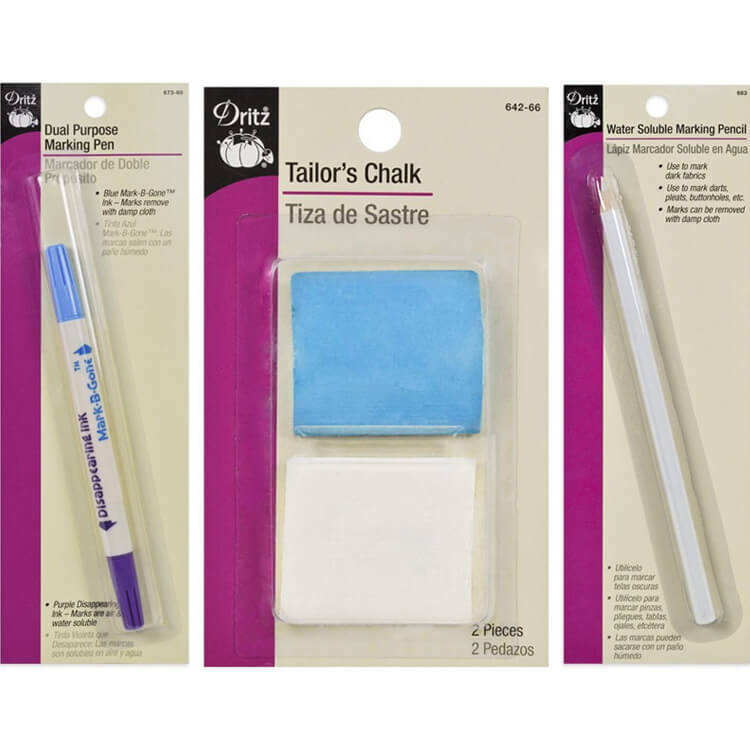 We have a great selection of pencils, chalk, markers, and more that cover all your fabric marking needs. Most are water soluble, and some can be brushed off after cutting the fabric. A dual tipped marking pen has 2 sides, the disappearing ink side is air and water soluble, so the marks will disappear eventually no matter what. The Mark-B-Gone side is water soluble and will not dissolve as quickly. This side is not recommended for dry clean only fabrics. Both the disappearing ink and Mark-B-Gone choices are available separately. Marking pencils are best to use for making darts, pleats, buttonholes, and transferring pattern markings onto the fabric. They can be water soluble, or come with a brush to help remove the marks. Use white pencils on darker fabrics. Tailor’s chalk is primarily used in tailoring projects for marks like ornamental embellishments and hemlines. It can also be used to mark dark fabric since fabric markers aren’t bright enough to be seen on darker fabrics. A fine line permanent fabric pen can be used to shade and add dimension to ornamental needlework designs, or to sign quilts with no ink bleeding. The nib of this pen is 0.58 mm. There are also colorful fabric markers for drawing and making permanent designs on fabric. These are not meant for temporary fabric marking, and the ink will not show up on darker fabrics. Find all fabric markers here.